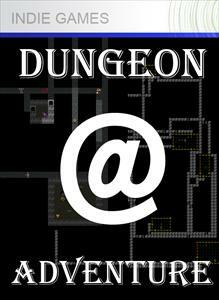 A Roguelike, for those not in the know, is a randomly generated dungeon crawl. You start on “floor 1” of the dungeon, and are expected to kick arse and take names all the way to the bottom, gaining weapons, levels, and abilities in the process. However, the main trick behind the Roguelike genre is the unforgiving randomness: Monsters can be stronger and meaner than you, weapons and items can be cursed, and traps can abound. With no save points, no reloads, and no sympathy, winning a Roguelike is like beating a grandmaster at chess – your tactical ingenuity is peerless. Roguelikes are traditionally graphically ASCII-based, revealing the agedness of the genre. And, much like aging a fine wine, Roguelikes often take over a decade of tweaking, refining, patching and editing to be recognized as the gems that we know and love today – Nethack, the most iconic Roguelike, is still having variants developed and improved over 20 years later. The reason I’m emphasizing the tradition behind Roguelikes is to put the review into context. 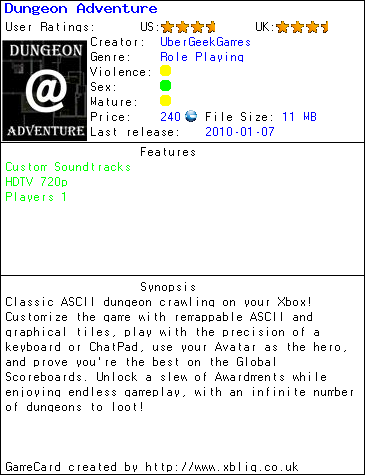 Upon playing Dungeon Adventure, you get the large feeling that entire aspects of the genre are missing. While Dungeon Adventure does get the core gameplay down correctly, more features and options are definitely required. * Your only character information pane is a crude inventory, wherein you can compare weapons and armour on a most basic level (simply a +strength or +defense modifier). * Monsters that you fight have the same name floor after floor, and simply “beef” up in difficulty on deeper levels. * Traps are non-existent, either for you to set, or for you to inadvertently spring. I suppose this is mirrored by the lack of a skill system, which would need to include the ability to disarm or set traps, amongst other features. * Stairs are always one-way (down), meaning that you cannot return to previous levels to continue exploration or leveling. That’s not to say that the game is completely worthless or without merit, to the contrary, there are some pleasant innovations added to the game that I appreciated, such as a local and a global leaderboard, the ability to message your score to friends as a challenge to them, a “fastwalk” button to speed through exploration, and the inclusion of multiple input designs (gamepad, chatpad, or USB keyboard). Each of these innovations work well on the 360, and show that Ubergeekgames put some thought into their Roguelike development. If I seem heavily critical of the Dungeon Adventure, it is only because I see so much room for improvement. I would encourage fans of the genre to support Ubergeekgames, and I would encourage Ubergeekgames to continue to put time into adding fulfilling features. Ubergeekgames has an EXTREME head-up advantage on every other Xbox Roguelike by being the first one out of the starting gate, and I’m hoping that they choose to support the early adopters, and really make the product shine with continued improvements, patches, DLC, or upgraded sequels. Ubergeekgames, we all know what the decade-old, ‘veteran’ versions of Nethack look like – the only question is how long will it take yours to stand with the titans, and if you’re willing to stick to it long enough to show off that polish, or if this game will remain a semi-finished and lost opportunity. I liked the demo, but then forgot about it. Thanks for the review to remind me to go play it more. It is not perfect, but it is fun. Although I agree with your views that there are many things that could improved upon in Dungeon Adventure, its simplicity (and owed to that, its quick pace) is the main thing that has drawn me back in for another ‘gotta beat my last score’ session everytime I boot up my 360. That’s a cop out Syted. Virtually all roguelikes have a very simple commandset for doing the things that this game allows you to do. You don’t want all the depth and good programming that a well thought out roguelike offers, then fine. Play any roguelike and just make suicide runs without dealing with depth that game offers. Same thing. I need to correct the author slightly though. I agree the global scoreboard is a terrific idea. If it worked! He also suggest that monsters just become tougher when you go deeper into the dungeon. Actually its worse than that. They get tougher as you get tougher. I found 5 increase level potions on level one, and was easily killed by level 2 of the dungeon. I’ve been down to level 6 of the dungeon without a single fight and it might as well be the first level. That being said, I’d also like to support this little gamehouse, and hope they do continue to develop this title out of it’s alpha stages.